IQ Inc. was named as a finalist for the 2007 Pittsburgh Business Ethics Award in the Small Business Category (less than 250 employees) by the Pittsburgh Chapter of the Society of Financial Service Professionals. This award is presented annually to honor local companies who demonstrate a commitment to ethical business practices. A number of factors were taken into consideration when selecting the recipients of the PBEA, including everyday operations, management philosophies and responses to crisis or challenges. Other nominees for this category included Courtesy Suzuki and Metropolitan Window Company; Henne Jewelers was named the winner for this category. The 2007 awards marked the seventh annual presentation of the Pittsburgh Business Ethics Awards (PBEA) by The Pittsburgh Chapter of the Society of Financial Service Professionals. Sponsors included: the University of Pittsburgh’s Katz Graduate School of Business and Berg Center for Ethics & Leadership, KDKA and the Allegheny Conference on Community Development. 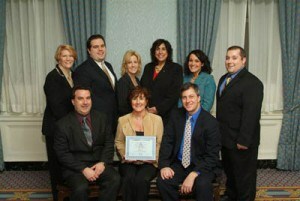 The recipients for 2007 were presented with their awards at the special luncheon at the Omni William Penn Hotel on Friday, February 15th.